We are a general contractor specializing in commercial tenant improvements. Our teamwork approach with our employees, subcontractors, and clients creates a positive work environment. We pride ourselves on building relationships with clients and completing projects in a timely manner. JM Lehman Construction, Inc. has been serving the bay area since 1991. We are a family-owned company which focuses on quality construction in the commercial and residential fields. No job is too large or small for us. We pride ourselves and our success on delivering high quality construction, completed in a timely manner and within budget. • Our residential division focuses on drywall, taping & finishing (all levels and textures). 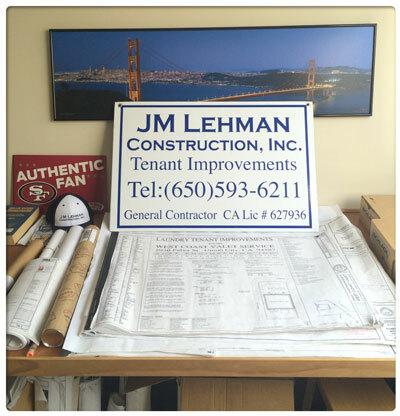 JM Lehman Construction, Inc. was established in 1991 by Jack Lehman and is now a family owned and operated construction company. Jack has been in the construction industry for over 35 years with great experience in commercial tenant improvements. In 1999 his son, Matt Lehman graduated from Chico State University and came home to join his dad in the construction company. Together they pride their company on building realtionships with their clients and completeing projects in a timely manner and within budget.